Consumption of tree nuts is associated with lower cases of obesity and metabolic syndrome, suggests a new study from Loma Linda University Health published in the peer-reviewed online science and medicine journal, PLOS ONE. Researchers from Loma Linda University School of Public Health studied the nut consumption of 803 Seventh-day Adventist adults who are subjects from the Adventist Heath Study 2, possibly the largest study involving vegetarians. The study found the association between the tree nuts – almonds, Brazil nuts, cashews, hazelnuts, macadamias, pecans, pine nuts, pistachios, and walnuts – and metabolic syndrome and obesity in a population that has a wide range of nut consumption, ranging from daily to never. Average tree nut intake was 16 grams per day among the high tree nut consumers, and five grams per day among low tree nut consumers. The study was funded by the International Tree Nut Council Nutrition Research and Education Foundation. 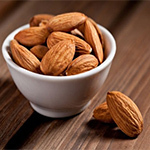 “Our results showed that one serving (28 grams or one ounce) of tree nuts per week was significantly associated with seven percent less metabolic syndrome,” said lead researcher Karen Jaceldo-Siegl, DrPH. “Doubling this consumption could potentially reduce metabolic syndrome risk by 14 percent,” she said. Metabolic syndrome is a cluster of risk factors shown to be an increased risk for chronic diseases, such as cardiovascular diseases and type-2 diabetes; and death. In addition, Jaceldo-Siegl said, there were fewer cases of obesity among high tree nut consumers compared with low tree nut consumers. “Tree nut consumption in this population has strong inverse association with obesity," she said.